I was honored to be the Master of Ceremonies for the recent dedication of the new John Lennon stamp on Friday, September 7th, 2018. 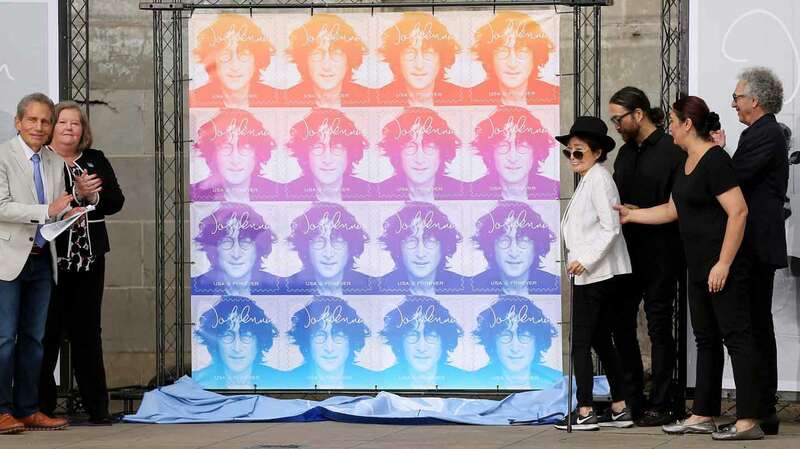 John Lennon was honored with his own stamp by the United States Postal Service as part of their Music Icon series. It was the official first-day-of-issue ceremony held in Central Park at the Naumberg Bandshell, not far from the park’s Strawberry Fields that memorializes John. Yoko Ono and their son Sean Ono Lennon were there to address the crowd and together with Postmaster General Megan J. Brennan and photographer Bob Gruen (whose iconic photo was used) we pulled the cord to reveal the stamp which comes in four different colors. I introduced each of them and they all reflected on what the day meant. I recalled my own special afternoon that I spent with John live on the radio in 1974. It was a great day and I’m proud to share it with you. Along with the speeches, the 1973 video for Mind Games was shown that features John as he walks through Central Park and dances at the very bandshell we were all gathered in. The ceremony closed with the Imagine video. It was a beautiful and meaningful day and I was so glad to be a part of it. You can read more about it here and watch the complete ceremony as it unfolded.